No, we are not talking about lichens and water purification products for when you are inadvertently lost hiking in Sherwood Forest. This is a much more realistic challenge: Finding something decent to eat when visiting the National Parks, never what anyone would consider foodie meccas, but surprisingly good if you order well. Having recently visited Yellowstone and Grand Teton National Parks, myMEGusta found quite a bit of better than average eats in and near them. But, unlike when visiting a national treasure like the Eiffel Tower in Paris, France, or the panda preserve in Chengdu, China, eating well required a little effort. Jackson Hole, WY, considered a gateway city for these parks, and also a mecca for moneyed skiers (the international airport in this little burg fills up with private jets every winter), provided an encouraging start to the journey. Of course, being a normal town, nothing there was under the auspices of the National Park Service (Happy 100th Birthday!) concessionaires, and restaurants ranged from frighteningly pedestrian looking to really excellent. 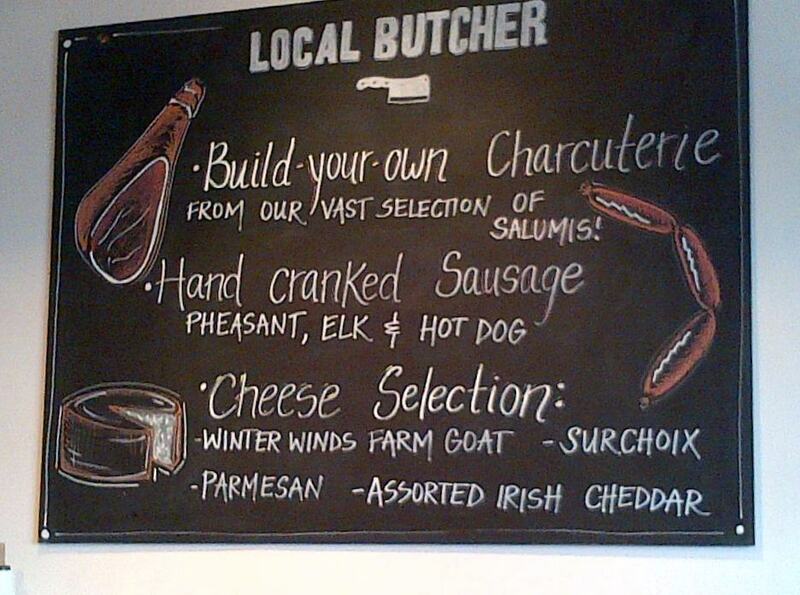 Local, a restaurant focused on fresh local ingredients, is a case in point. http://localjh.com/ After a terrific lunch of smoked local trout Salad Nicoise (the inspiration for September 8th’s posting), myMEGusta went out for a short (that’s all there are in Jackson Hole) stroll, and stumbled upon Local’s retail butcher shop, more of a little deli/take-out joint, but interesting all the same. Sitting in the case were the most gorgeous pork rib chops she has seen outside of Europe: Relatively small in diameter, cut thick, a deep red hue. 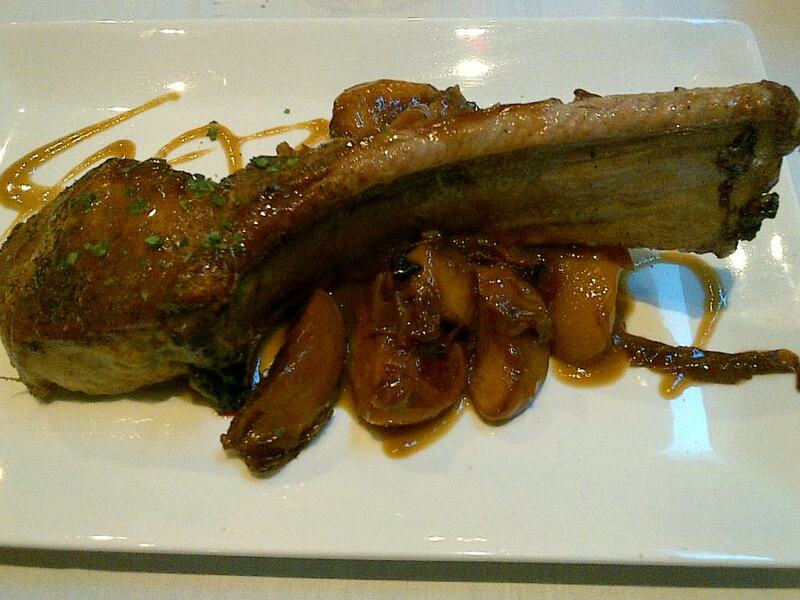 Of course, that meant getting a reservation to go back for dinner, and it was one of the best meals of the trip: Snake River Farm Kuributa Long Bone Pork Chop with a Bourbon Glaze over Roasted Peaches. A breed of Berkshire pig, this specific one from the Kagoshima Prefecture, Japan, also known as “Kagoshima black pig”. 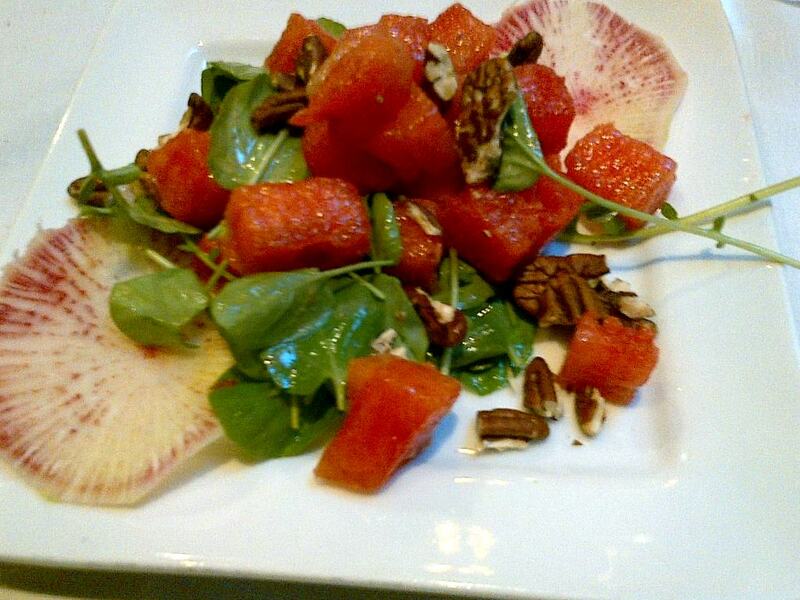 http://www.snakeriverfarms.com/ The watermelon salad, graciously served as a half portion, was terrific, too. Tempted to go back the next day for a third round, myMEGusta chose instead the local “hot” restaurant, the Snake River Grill. They somehow managed to overcook and underseason locally farmed Snake River Rainbow Trout, something to write home about, but not in a good way. The good news was that fresh grilled trout was ubiquitous in the park lodge restaurants, and considerably better at every other attempt, including the second one at Jackson Hole’s Wort Hotel, http://www.worthotel.com/ , where it was delicious. Another highlight was at the Jackson Lake Lodge http://www.gtlc.com/dining in Grand Teton National Park: Colorado Rack of Lamb. There was nothing fancy about this: Two perfectly cooked (medium rare, as requested), extremely flavored chops (a “just right” portion). Most lamb sold in the US is from Australia and New Zealand (both excellent, by the way), so it was a real treat to have American lamb, outrageously expensive on the East Coast. Partridge was another treat at the Jackson Lake Lodge. Not an easy bird to cook, it tends to dry out quickly, so its juicy, perfectly cooked texture was a pleasant surprise. 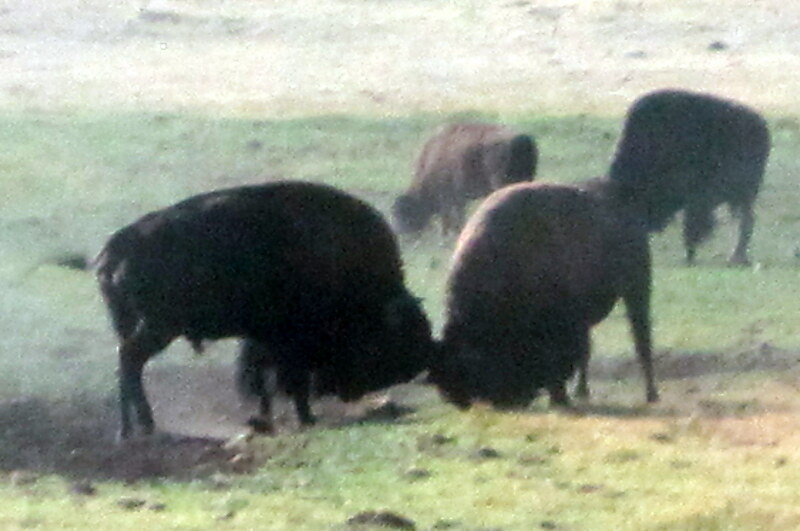 The real wilderness “win” was the bison burgers, found everywhere and lean, but still juicy, when ordered medium rare. 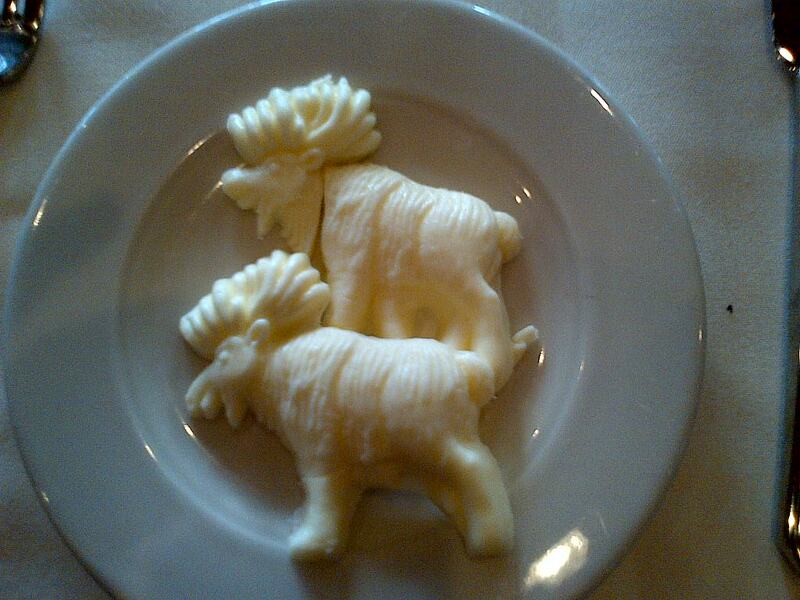 We were advised by a local authority that it’s really hybridized beefalo, which is fine, and makes sense given that bison (what are often referred to as buffalo) are wild, dangerous animals, not realistic for domestication. Another pleasant and reliable dish is plain old chili (think cowboys around a chuck wagon campfire). The version I tasted in the Prospector Restaurant in Cooke City, Montana http://cookecity.net/webcams/ was a fresh, flavorful beef/bean concoction (and the side of Tabasco made it chili-like). What would have gotten sent back in Austin, TX, was a good lunch in the Wild West. Moving East, the Jordan Pond House at Acadia National Park used to serve fantastic steamed lobster and was famous for its popovers, a perfect snack after hiking. Readers who have visited in recent years can weigh in on whether or not these treats still exist. The bottom line is, keep it simple and local, and you’ll up your chances of eating well. 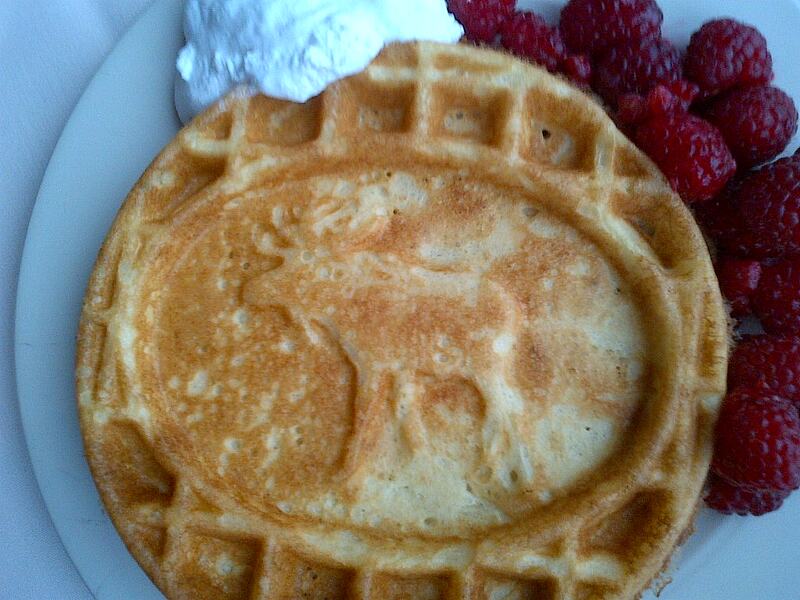 And, speaking of treats, the moose shaped butter pats and moose motif waffles at Jackson Lake Lodge were silly but fun! Sounds so appetizing but I have to wait till next summer to go there. Now winter is approaching, my skiing days are over and I have to wait until summer and the mosquitos are gone. Always a treat to hear of your travel dining!! !